This 2 pack （one pair)6 FT Length Black Rubber Washing Machine Hoses are ideal for use as hot or cold water supply lines in laundry room. These hoses have Anti-Corrosive Couplings, Pre-Installed High Quality Orange EPDM Washers, and 800 PSI Burst Strength.They are made from polyester-reinforced EPDM rubber with steel-plated couplings with brass stems. Hoses exceed AB 1953, NSF 61,CUPC/UPC standards, and are designed for use with both hot and cold water. 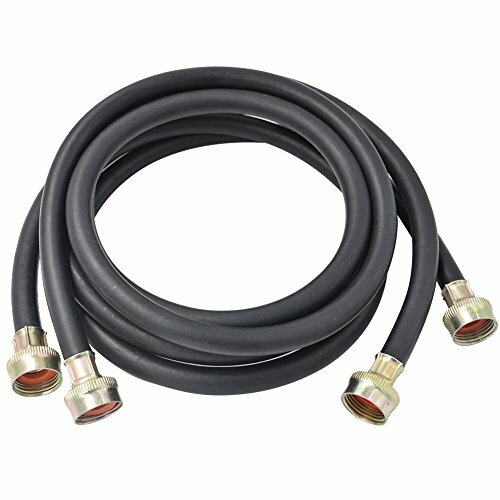 Hoses are better than stainless steel and will not conduct electricity.They are rated to 190 degrees F.
This is a great product and very inexpensive insurance against a hose leak. Pick up our TTFLEX Brand washing machine connectors and compare them to any other off the shelf washer hoses. You will feel the high quality materials and workmanship. Preventative maintenance is the competitive advantage. An ounce of prevention is worth more than a pound of cure. Don't risk other low quality hoses leaking water and damaging your home and property. Steel-plated couplings with brass stems. 6'(72'') LONG, 2 pack Black Rubber Washing Machine Hoses. FITS ALL WASHERS - Easy to Install.The Bigger Diameter 16MM with Wide opening. 800 PSI Burst Pressure. Rated to 190 degrees F. North America Quality Insurance. Manufacturing laundry hose, washing machine fill hose, stainless steel hose, washing machine supply hose. High Quality EPDM oranger rubber washers, AB-1953, NSF-61 certification and UPC/CUPC approved. If you have any questions about this product by TT FLEX, contact us by completing and submitting the form below. If you are looking for a specif part number, please include it with your message.